When the time comes for you to get a new door, you'll need to carefully consider all of your options, since this electromechanical device can be part of your property for the next couple of decades, and potentially even longer. The traditional options are wood, steel, and aluminum. Wooden doors can very aesthetically pleasing, but will require a lot of maintenance in order to be preserved. Regular repainting and application of rot preventing coating will be required. Steel doors, while more durable and easier to care for, still require some maintenance, as they can suffer from rust, and must be regularly inspected for it. Some steel units now have faux wood cladding, which will make them more pleasing to the eyes. As for aluminum, it requires very little, if any, maintenance work, and won't require as powerful an opener as steel and wood will. However, it is about as far from durable as it gets, and will easily dent from impacts. R-value is a number that suggests how insulating a door is going to be. Each door is built with a layer structure. The more layers there are the greater the door's weight and insulation quality will be. Rigid polystyrene panels and polyurethane foam are the two main insulation methods used in garage doors, each with its different benefits and disadvantages. The best way to tell how energy efficient a door is going to be is to simply check its R-value. When replacing your existing garage door, it's also advised that you replace the system's other hardware components as well. This will give the new unit a more reliable performance for a longer time. Some doors will require that you make the switch from extension to torsion springs. You may also want to consider replacing the rollers, as nylon coated ones will be better than regular steel variety when it comes to silent operation. As for your opener, it will have to be able to produce enough horsepower to properly operate your new door. That means that if your new system is heavier than your current one, you may also need to replace your opener. New models have all sorts of different safety and security features, so you may want to consider opener replacement regardless. There's no reason for you to have to deal with this on your own. 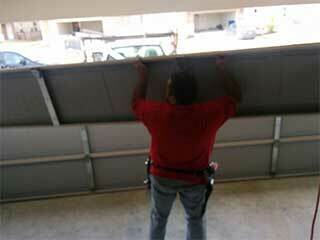 Our experts at Garage Door Repair San Mateo will be happy to guide and consult you through this process. We have a wide selection of both garage doors and openers available. Call us today.